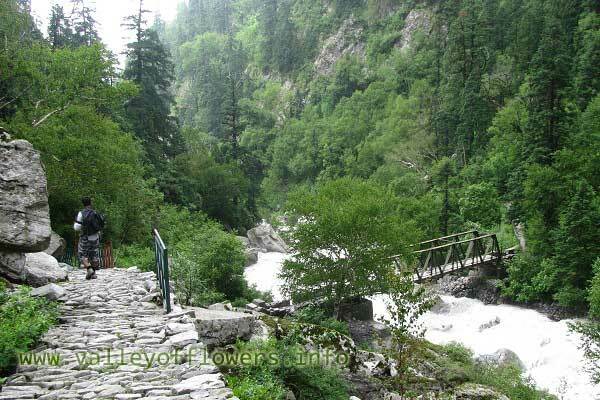 Two vital bridges are missing between Govindghat and Valley of Flowers. Trek between Govindghat and Ghangaria is also badly affected. Government has many other issues to solve before it can start working here. I had talks with some locals and come to know that this year the trip to Valley of Flowers may not be possible. The vital bridge on Alaknanda River is swept way in flood. Gurudwara Management committee has already called off Hemkund Sahib Yatra this year. If we start one be one the hurdles in our trip to Valley of Flowers they can be summarized as follows. We need at least a temporary bridge over Alaknanda. I think this will soon be made. Even if Hemkund Yatra is to be started next year the repairing work has to be done this year only. The accessibility of Ghangaria is only for 5 months a year. To start any work on trek this bridge has to be constructed. I am very positive that the bridge will be constructed soon. Govindghat market before the destruction. All this is swept away in floods. Now it has become river bed. 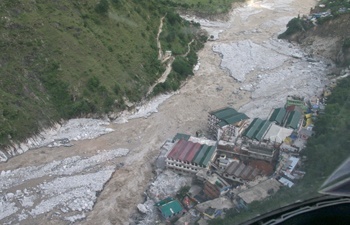 Govindghat after the destruction, many hotels, Parking and a vital bridge swept away. 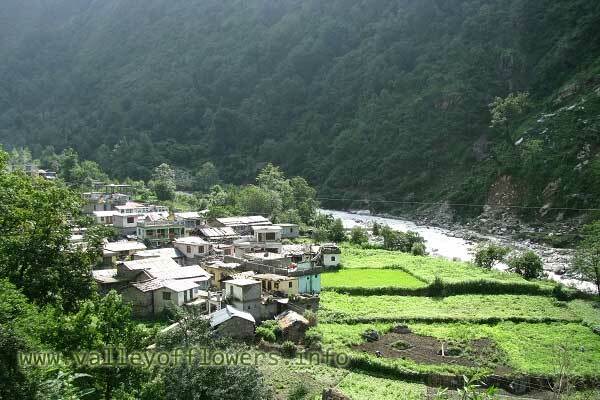 Our trek between Govindghat and Ghangaria is at many places near the Pushpawati River. It is badly affected and needs to be rebuilt. You can imagine the destruction Pushpawati River would have done by comparing the pictures of Pulna Village below. Beautiful view of Pulna Village before the flood. This village is just three kilometers from Govindghat on our trek to Ghangaria. 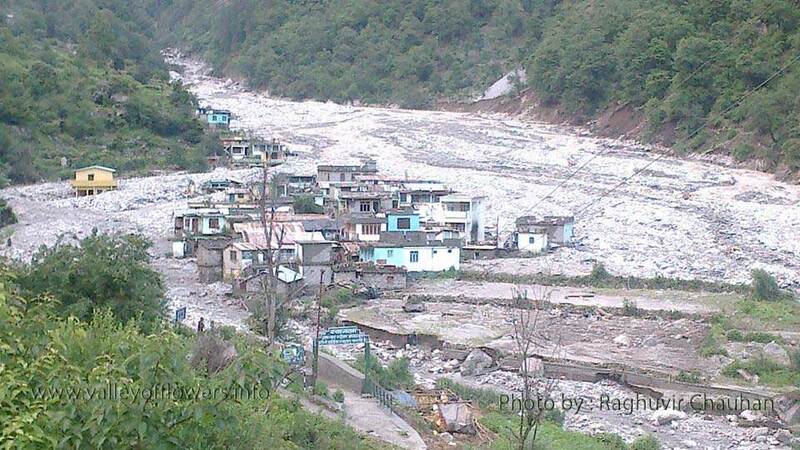 Beautiful village Pulna is all destroyed in floods. This village belongs to hotel owners in Ghangaria. Even Bhyundar is also swept away. To repair and rebuilt the trek it may take this full season. However the temporary trek may be built soon. Once the trek is repaired and rebuilt we can reach Ghangaria. However I do not have confirmed reports but I am apprehensive about a vital bridge over Pushpawati River on our trek between Govindghat and Ghangaria(See picture below). Bridge over Pushpawati River between Govindghat and Ghangaria. You can see the trek so near to river. It is washed off now. There are many places where the trek is so near to river. Bridge over Pushpawati River on the way from Govindghat and Ghangaria. This bridge is three kilometers before Ghangaria. Now not present. Considering the destruction at Pulna Village there is high probability of this bridge being swept away in floods. If it is also swept away it needs to be rebuilt. This used to be my favorite spot for sitting and watching the river for some time. It was really a very romatic place on the trek to Valley of Flowers from Ghangaria. You can see some golden moments of past in below images. Some golden moments at the bridge in 2010. I used to sit near this bridge for hours together. You can see beautiful scenes from here. Even Auli grounds are visible from here. 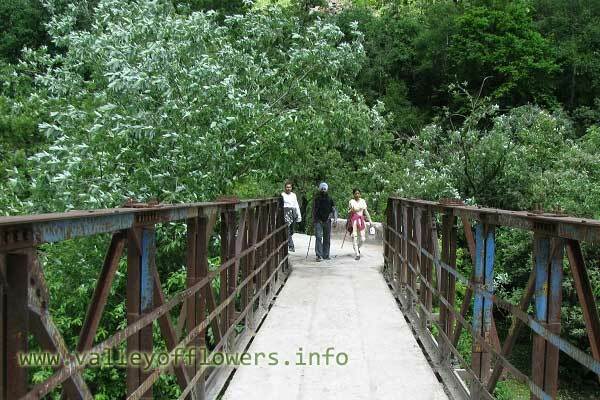 Bridge over Pushpawati, Just 500 meters inside Valley of Flowers entry gate. This bridge is swept away by floods. This picture was taken in 2010. Unfortunately I have confirmed reports that the bridge is not there anymore. Considering the facts that to reach up to this point we need to first correct step one and two, it may take lot of time. I have a strong apprehension that the trip to Valley of Flowers may not be possible this year. However I have reports that Village Ghangaria is not at all affected by floods, all hotels are safe. The trek between Ghangaria and Hemkund Sahib is also ok. All the information given above is collected from my local sources. ‹ Only one hurdle in visiting Valley of Flowers this year. The broken bridge over river Alaknanda at Govindghat. I have just been to hemkund sahib….the trek from govindghat to ghangria which was 12 kms before is more like 15 kms now and is very steep on the gradient side then before because of the new track built. They have constructed temporary bridges to connect to ghangria and I inquired from the locals who told me that Valley of Flowers is also affected and there was no bridge to connect to it anymore and they were not working on it right now. Hopefully it will be there by next year.The trek to hemkund sahib is completely intact but bhyundar and pulna have been washed away very badly. Thanks for the update. 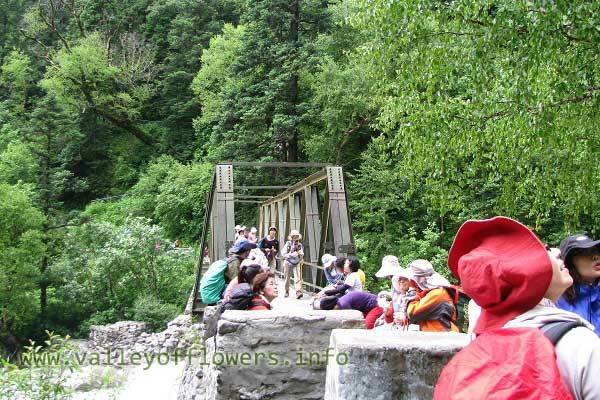 The bridge connecting Ghangaria and Valley of Flowers is built recently and the trek is being constructed. The Valley of Flowers will be opening only in next year. I will be going in first week of October, just for latest updates. You know what me had planned to the last details to trek in July at Valley of Flowers, But unfortunately due to floods everything got ruined. I was really excited about this trip, now totally dejected, Nonetheless i am not sure if i can make it again in this lifetime, Cos i am leaving our Country in a Couple months Time…..
Ghangaria is accessible now but with some extra effort. You can try to go in last week of September. 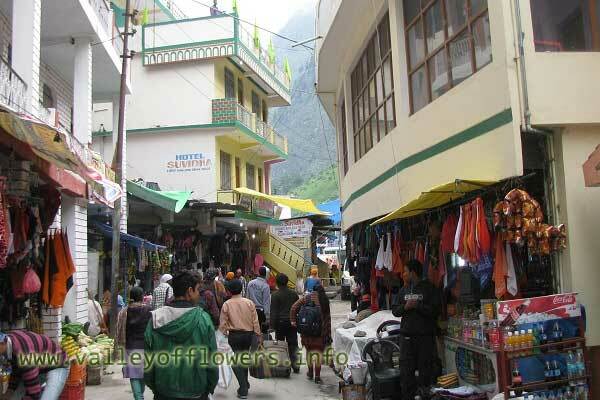 Valley of Flowers may not be accessible by that time but you can go to Hemkund Sahib where you can find many flowers. In fact in September there are more flowers at Hemkund Sahib then in Valley of Flowers. 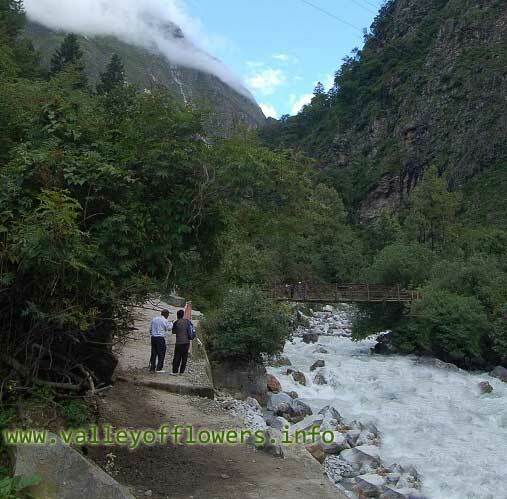 We had been at Valley of Flowers and Hemkund Sahib during July 2012. It is really painful to receive such natural calamity information. Thank you for updating. Keep updating Sir. Thanks for posting. I will keep on updating. The picture/photo of pulna village is taken by or someone else? Can anyone please tell me something about the Bhyundar village and the condition of Ghnagaria? It was taken by a local only. Pulna Village is cut off now and no one can go there except by Helicopter but soon a temporary bridge will be constructed over Alaknanda River and rehabilitation work and construction of trek between Goindghat and Ghangaria can be started. I talked to a local from Bhuandar and sorry to tell you that the Village is also swept away by floods. However the good news is that village Ghangaria is intact and the trek between Ghangaria and Hemkund Sahib is also intact. The trek towards Valley of Flowers is damaged at some points. However the main part of Valley of Flowers is intact and next year we will go to Valley of Flowers for sure. Dear Devkantji, we are, a group of 4 friends from Kolkata has planned to visit there on 1st week of Aug’13. Now it’s really heart breaking news that Valley of Flowers trip may not be possible in this year. But our sadness is nothing comparing the sufferings of the local people there. 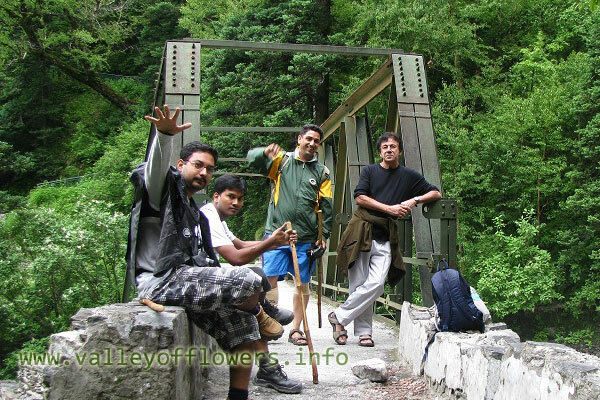 However, do you have any information about present situation of Valley of Flowers itself? Has the plants & flowers not been washed out by flood? If so do we expect flowers in next session? As Less Flowers means less seeds this year and less Plants & flowers in next year. It is my pleasure to hear about this from an experienced one like you. Another personal request to you. I’m very much worried about one Sadhuji named “Suddhatmananda maharaj” (popularly known as Gufame Rahnewala Sadhuji) living in a cave near PULNA. I have to handover some medicines, used for day to day requirement of the local people, to him during my visit there. In each winter he came to Kolkata and we send medicines & other essentials through him. We also worried about some of boys n girls of Pulna village, came last winter to Kolkata with him. As he does not use any mobile I can’t contact him. If possible, please bear some pain to collect his whereabouts from your local connection and let me know. I’ll be grateful to you. As of my personal knowledge and knowing the geographic conditions of Valley of Flowers I feel that the flowers in the valley are intact. Please do not worry about the number of flowers, you will find them for sure next year. There are many small streams in Valley of Flowers and they can not cause damage to flowers. moreover the day it was flood in Pushpawati river, there were very less flowers. Many different species are yet to even germinate. Take my words for sure this heaven is still intact, I talked to forest officers from Ghangaria and they told me that the plants in the valley are intact. You can expect some damage on the banks of river Pushpawati river. At Pushpawati River Bed the slope of the river is not so steep so do not expect much damage there and moreover plants are not like human beings which disturb nature, they are part of nature. Nature will not harm them unless there is human activity. I really have no knowledge about him. But will definately try to find out with local people. Actually even Pulna Village is not accessible due to absence of a bridge over Alaknanda River at Govindghat. 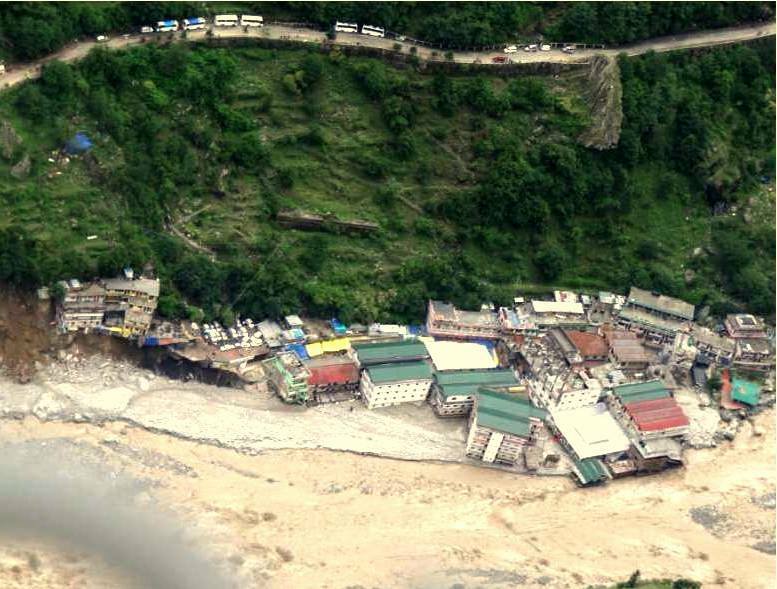 Actually all the villagers, Hotel owners and other person all are evacuated from that area t Joshimath and some of them are currently staying in tents. Thanks for your positive reply! However we have got his information yesterday. One of the local folks has called me & I also talked with him. He is Safe. Looking for updates about this trail at your blog. 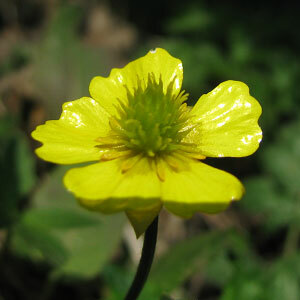 Ranunculus laetus is a perennial herb of height 25-50 cm. It has much branched stem. Basal leaves are up to 10 cm. Upper stem leaves are similar except being smaller. Flowers are bright yellow and glossy.